It’s not an uncommon sight to be seeing people walking around with white paper cups from any of the popular coffee chains. They’ve practically become a status symbol, indicating that you’re not just drinking any ol’ coffee, but serious coffee from The Best Ever Coffee Shop. Yeah, sure. 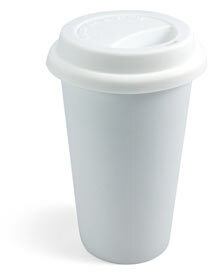 Here’s something to either fool other people or make them think it’s totally clever: I Am Not A Paper Cup. Looks trendy, sure, but it’s made of ceramic and–yay!–washable. You can probably take this to a coffee shop too and see baristas do a double-take when you ask for coffee to go in your own cup. Next Post Head down to The Green Faire!